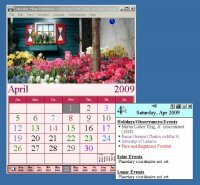 CCalendar is a free Windows calendar software supports Google Calendar and Yahoo! calendar. It is featured with multiple calendars support, easy agenda generating and printing, handy TO-DO list and integrated weather forecast. CCalendar Personal Edition is best for individual who has the need to manage their personal and work events with an easy-to-use calendar tool. 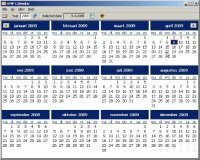 Calendar Mine is a minimal basic calendar package. It is a fully functional, perpetual calendar, accurately calculating dates from 1583 to 2500 AD. It has over 500 built-in holidays for 30 different ethnic and religious groups. Date and time calculations such as seasons, sunrise, sunset, moonrise, moonset, and moon phases are accurate anywhere in the world. With our powerful scheduling engine, you can easily add your own events to the calendar. You can even maintain multiple schedules. Some of its other features include maintaining a to-do list, pop-up event reminders, and a compressive date calculator. Keep track of your important dates with A Better Calendar, easy to use calendar software which looks like a paper desktop monthly calendar but does much more. Attach notes, schedules and audio to any day, set alarms to remind you of important tasks, find notes and dates fast with date and text search options, print blank calendars, schedules and notes, and even upload a web calendar to share online with friends or associates. Calnique™ has a unique, full screen interface allowing you to easily see your monthly, weekly and daily schedule. Calnique™ has everything you'd expect from an ordinary, every day calendar but our customized features are built with our users needs in mind. Bryht Task Calendar is a professional task manager, which helps you schedule, trace, and share your daily, weekly, or monthly tasks, increase your productivity and efficiency, and create well-presented plan and progress report for team members and manager. 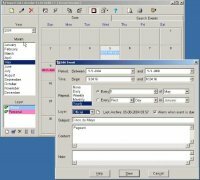 It includes calendars with full drag and drop support, and MS Word-like table editor. It is also a substitute for your current calendar tool to allow events to be traceable. Never miss an important event again with 4t Calendar Reminder MP3. Simply enter the event information and as it approaches, you can be reminded with a message, email, sound or video (MP3, WAV or CD Audio). It can even open a specific application, open a web page or other document. Its MS-Office based interface means that you will be organising your coming year in no time. Scheduling tool with calendar, alarm and reminders. Ever felt that you have problems managing your time? With SuperCool Calendar on your Windows desktop this will never be a problem again. No more missed meetings or birthdays, no more unnecessary stress because of bad planning. Get more freedom and feel more relaxed by simply knowing when to do things. Don't let time control you - you control time. 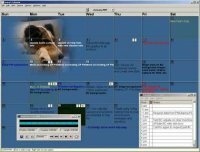 Calenz is a personal calendar which runs locally on your PC. It allows you to enter any events for days on or after today and Calenz will remind you on the events occurring today and tomorrow. Use it as a means to remind you of important or special days and to schedule your timetable. 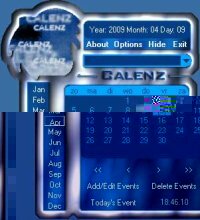 Calenz can load when Windows boots up and it will notify you with a window of the events happening today and tomorrow. It minimizes automatically after you have read the events or when there are no events. Debrief is PC software to handle note overload. Keep your notes in one place, saved in your PC. With Debrief, organization can becomes habit, while hardly even trying. Debrief provides a significant step toward remembering what you know, and where you put it.